Classic Eggs Benedict or a revised edition, you decide! My friend Kristin guest posted here a few weeks ago, and prior to that, we did a Pi Day Recipe Swap. In our discussions about those posts, we kept getting sidetracked talking about all the cool stuff we could make. Those conversations led back to Eggs Benedict. Every. Single. Time. We decided that the only way for us to get this creativity out of our system was to cook together. Eggs Benedict it was, and that was F.I.N.E. fine with me because I haven’t had hollandaise in decades. This classic sauce of Dutch/French origin consists of egg yolks, butter, lemon juice, and seasoning. You can find the Epicurious version of blender hollandaise here. Feel free to cut the recipe in half if you aren’t serving 12 people, or find some other wonderful things to drizzle with hollandaise, like asparagus! I know, it sounds scary. It isn’t at all! It’s truly simple. Essentially, hollandaise is a mayonnaise made with less fat. That didn’t make you feel any better about it, huh? Trust The FarmGirl! Mayo is easy to make, too! While I agree that it’s entirely too decadent for regular dining, hollandaise can be blended up in minutes and spooned over any number of things: a delicate piece of fish, steamed or baked to perfection, steamed or grilled asparagus, roasted garlic-potato wedges, steamed cauliflower (pop it under the broiler for just a minute to ‘gratinee’ the top). Stir in some fresh herbs, too, such as tarragon or basil – they’ll only enhance the buttery richness of the sauce. First up, we started with the Classic Eggs Benedict: lightly-toasted English muffin halves topped with pan-fried slices of Canadian bacon, poached eggs and a generous ladle-ful of hollandaise. A sprinkle of paprika or cayenne (adds heat) decorates the top. Need help with the poaching? Check out Smitten Kitchen’s tutorial. If you’re going grain-free, try a vegetarian version of the classic using whatever veggies you have on hand as a base. For these, we used sauteed mushrooms, sliced avocado and some TO DIE FOR slow-roasted plum tomatoes that I had in the fridge. This version was so flavorful that I really didn’t miss the bread and meat at all. For our last effort of the day, Kristin came up with Cajun Eggs Benedict. The requisite poached egg and hollandaise were perched atop a heavenly (made in advance and reheated) jambalaya rice cake [Cajun rice dish mixed with a bit of egg and flour added to bind, then dredged in flour/egg/breadcrumbs and fried to golden]. My father called me the day after our cooking spree – and his tasting spree – specifically to see if I had any of the cakes left. Sadly, I did not. I thought they needed some color and a little pizzazz when plating, so I set the rice cakes ‘n’ eggs upon a bed of arugula dressed simply with extra virgin olive oil, salt and pepper. As was the case with my cooking adventure with Amy, cooking with Kristin was so much fun and way more productive than if I were cooking alone. It’s great to be able to get a different perspective on an ingredient or a recipe and in this case, I wasn’t simply reading about it – I got to taste it as it was being created! I read this article and found it very interesting, thought it might be something for you. 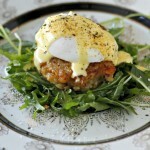 The article is called Eggs Benedict Three Ways: KC’s Hat Trick and is located at https://thefarmgirlcooks.com/eggs-benedict-three-ways-kcs-hat-trick/. This looks fantastic! I have never made eggs benedict before, but I really want to now! It’s way easier than everyone thinks! Let me know if you try it, please!